Dad of Divas' Reviews: Book Review - Ripley's Believe It Or Not! Dare to Look! Book Review - Ripley's Believe It Or Not! Dare to Look! Dare to Look! is the 10th book – and best yet – in the phenomenal bestselling Ripley's Believe It Or Not! annual series. It offers up the world of weird in an all-new collection of unbelievable stories from across the globe. The new Ripley's Believe It or Not! app allows hidden content in the book to come alive. Jam-packed with a mind-boggling selection of incredible facts, crazy stories, jaw-dropping pictures, lists and interviews, this fantastic book also comes with bonus hidden content that's accessible using our Ripley's Believe It or Not! app. Step right into the world of Ripley's and see it come alive by scanning the special oddSCAN™ logos with a smartphone to reveal exclusive videos, images and more. Organized into thematic chapters, the crazy stories are illustrated with a wealth of amazing images throughout. Published annually, with brand new extraordinary material every year, this interactive series presents the best of Ripley's Believe It or Not! Readers of Dad of Divas can get a great deal on the book right now by clicking on the following link - http://bit.ly/ShopDareToLook . You can purchase the book before it is released for 49% off. This book provided an amazing array of the strange, macabre and downright odd people, places, and things that Ripley's Believe It Or Not have been collecting for years. In this tenth annual book, you get to read about so many things that in my world I would never have guessed existed. On top of this though and the authors of this book have put technology to use to make the book come alive. 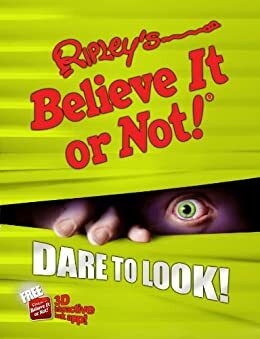 The Ripley's Believe It Or Not App that you can use with this book brings out a ton of hidden content and allows the reader to be able to engage at a much deeper level with the information that is being shared. I also I enjoyed the organization of the book itself as you can go from chapter to chapter and jump around the book depending on what you want to learn and watch you want to engage with. All-in-all this was a great book that will keep you on the edge of your seat wondering what will come next.